Replying to the question: may babies be safely treated by fasting, Carrington says: babies not only can be "treated safely by this method, but it is unsafe not to treat them by this means, when they become unwell." Fortunately, few infants require more than two to three days of fasting. I have had but few cases that required an extended fast. When nature cuts off the appetite of the infant, it should be permitted to fast until there is again a demand for food. If there is pain, fever, or inflammation, no food should be given. Infants may fast for days without harm. They lose weight rapidly and regain it equally so. They seldom have to fast as long as an adult. I have never hesitated to permit a sick infant to fast, and I have yet to see one harmed by it. The sick child that is not fed rests peacefully and sleeps most of the time. Parents do not realize how much unnecessary suffering they cause their feverish children and how much avoidable anxiety they cause themselves by feeding them when sick. Complications result almost wholly from feeding and drugging. They almost never develop in cases that are not fed and not drugged. If fasting is instituted at the very outset of whooping cough the child may never whoop. Vomiting does not occur in whooping cough when no food is given. Scarlet fever ends in four to five days and no complications develop. Measles, pneumonia, diphtheria, smallpox, etc., soon end if no food is given. 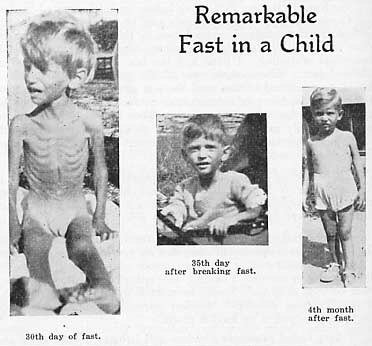 I have fasted numerous children and babies, in both acute and chronic diseases (no infants in chronic disease) and it is my observation that they bear fasting well, often making much less fuss about it than adults. It has been noted by all fasting advocates that children rarely require as long a fast as an adult suffering with the same disease. Being young, they have greater recuperative power, they are less toxic, and their organs are commonly less damaged. Babies and children are habitually over-fed. Indeed, over-feeding is perhaps, the greatest curse of infant and child life. As overfeeding builds disease in babies, it helps to account for a great amount of sickness among them and for many otherwise avoidable deaths. Certainly our children should be as healthy and vigorous as the young of other species, but such is not true. Our children are fed more, on the assumption that, as they are growing, they need much food to supply the materials of growth. How absurd are our feeding practices, based on this assumption, may be demonstrated by a little mathematics. A child growing twelve pounds a year grows but a half an ounce a day, or less, and he certainly needs but little extra food with which to provide this increase in growth. The above pictures of little Michael de Bellis of New York State, were taken during and after a fast of 47 days taken in February and March, 1941 for what was thought to be poliomyelitis. His last meal was taken February 15 (age 2 years, 3 months and 1 week), and he did not again taste food until noon of the 47th day. He was first able to move (slightly) the paralyzed left leg on the 30th day of the fast. No enemas were employed; he had a bowel movement on each of the 28th and 30th days. The above photograph taken on the 30th day shows he was then able to sit up without support. He was still able to sit up on the bed and play with his toys on the 35th day. Weight before he became ill was 32 lbs. ; at completion of the fast 15 lbs. He has been kept on uncooked foods since. Sun baths were given during and after the fast. When the overfed child has become sick nature indicates in every possible manner that food is not desired. The pain, fever, dry mouth and tongue, coated tongue, foul breath, lack of desire for food, nausea, vomiting, and other evidences that digestion is impossible, indicate in the strongest possible manner that no food should be urged upon the baby or child. Infants and children recover more rapidly while fasting than do adults and do not require to fast so long. There should be no hesitancy in withholding food until they are again ready to take it. To feed them under conditions of acute disease is not to nourish them. "In childhood," says Dr. Oswald, "chronic dyspepsia is in nearly all cases the effect of chronic medication. Indigestion is not an hereditary complaint. A dietetic sin per excessum, a quantitative surfeit with sweet meats and pastry, may derange the digestive process for a few hours or so but the trouble passes by with the holiday. Lock up the short-cakes, administer a glass of cold water, and, my life for yours, that on Monday morning the little glutton will be ready to climb the steepest hill in the country. But stuff him with liver-pills, drench him with cough-syrup, and paregoric, and in a month or two he will not be able to satisfy the cravings of the inner boy without 'assisting nature,' with a patent stimulant." --Nature's Household Remedies, p. 60. Where their troubles are light and there is still some demand for food they will not fast without considerable fuss. In such cases fruit juices or vegetable juices (raw or broths) may be permitted them. At one period I attempted to use diluted milk (50-50) instead of these juices, but it was never satisfactory. A short fast when baby is irritable, "out-of-sorts," or feverish, instead of the usual feeding and drugging, will save much suffering and prevent small discomforts from developing into more formidable bonfires. It has been fully demonstrated that repeated short fasts, of one to three days, in growing animals, when recovery is complete between fasts, produce better growth and greater strength. Children are not harmed by fasting, but only by starvation.